So, you also wanted to update your iPad to the latest iOS (to date, it's iOS 11), since Apple announced it since WWDC 2017? Out of all the new features iOS 11 has to offer, dock, app switcher, drag and drop, QuickType keyboard, instant markup, etc. which you could take a closer look here, I'm mostly interested in the screen recording feature. Why? Because it's a function that's supposed to be extremely useful to many of us, teachers, students, and technology professionals. Without a doubt, iOS 11 changes the iOS screen recording space quite a lot. Now it's a breeze to capture screen videos on your iPad. 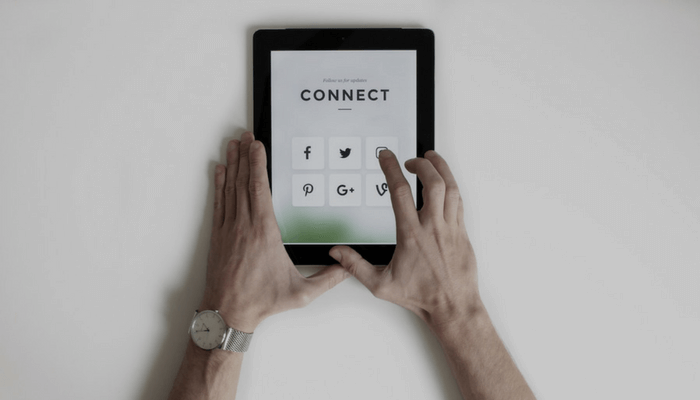 No need to use a computer or QuickTime to facilitate, no need to install third-party software or apps, it's just as easy as open your iPad and tap a few buttons. Apple has officially made it clear that iOS 11 will be available for users to download on September 19, 2017. As usual, I was waiting for the red update notification to pop-up on my iPad 4. However, I didn't receive the notification on my iPad. 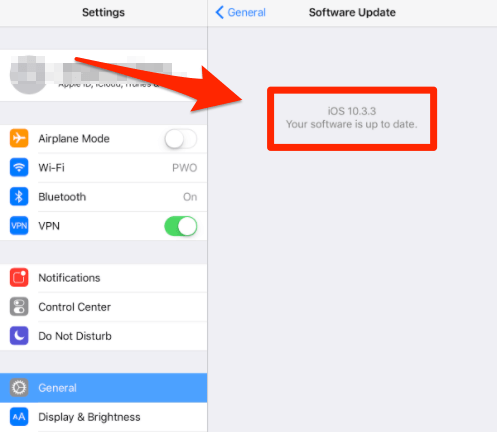 I remember I went several times to Settings > General > Software Update, but the text always shows "iOS 10.3.3 Your software is up to date", as you can see from the screenshot below. I thought maybe the Apple server was too busy to send out those notifications, and I'm not the kind of person who is eager to keep myself immediately ahead of the latest things especially technology. First, the downloading process within the first few hours — even days — tended to be very slow due to the crowding demand for the update (which can easily shut down any server unless it's Apple or Google). Second, major iOS or macOS releases were prone to security issues (here's an example), and it is advisable to not immediately pull the trigger. There's a saying in the tech space: "Let the early birds test it out." After a little bit research, it turned out the culprit is this: compatibility. 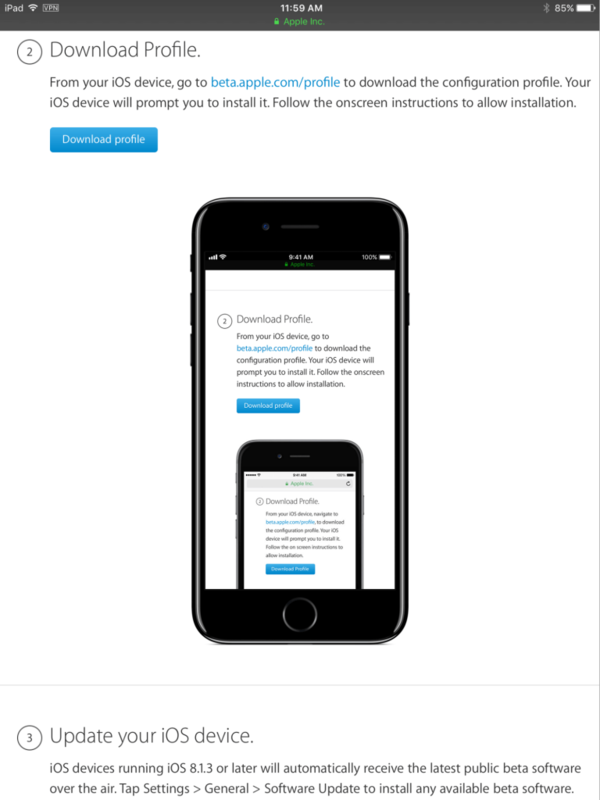 As you can see at the very bottom of this Apple page, there's a section "iOS 11 is compatible with these devices". From there I learned, sadly, that my iPad is not on the supported list. With sort of disappointment, I also surprisingly found that the iPhone 5 and 5C are not there either. Imagine how many old iPhone and iPad users had complained about this. It's been less than four years since our iOS devices become outdated — how sad is that? I really wanted to try out the screen recording feature in iOS 11, so I spent a few hours digging into the topic, hoping to find a way to bypass this compatibility issue. Here's what I tried — but didn't work, unfortunately. I signed up for the iOS 11 beta program hoping to manually download the package. At first, it seemed to work. I followed the instructions (see the screenshot below) until my iPad showed me a message like, "Restart your device to install this beta". But in the end, that step turned out to be fruitless, and the iOS version of my iPad still remained 10.3.3. Wondering if the error was due to limited storage, I also cleaned up the device, I then tried the previous step again. Still no difference. I also connected the device to iTunes on my Mac and tried to manually check the Software Update. It still said the iOS version, 10.3.3, is up to date. After that, I gave up begrudgingly. It is worth noting that Apple provides no explanations for why those devices are not included in iOS 11. If you’re interested in learning why you can learn more from this article. "While Apple isn't giving any answers, the likely reason why the original iPad is locked out from upgrading to the newest version of iOS is a memory issue." First, check the compatibility list as shown above to see if your iPad (or iPhone, iPod Touch) supports the new iOS. If, like me, you're using an iPad 4 or older edition, save your time trying to install it, as the most up-to-date iOS version you can install is 10.3.3. This is unfortunate, but there's no way you can get around that unless you buy a new iPad — which looks more powerful and attractive but is more expensive than ever as well. 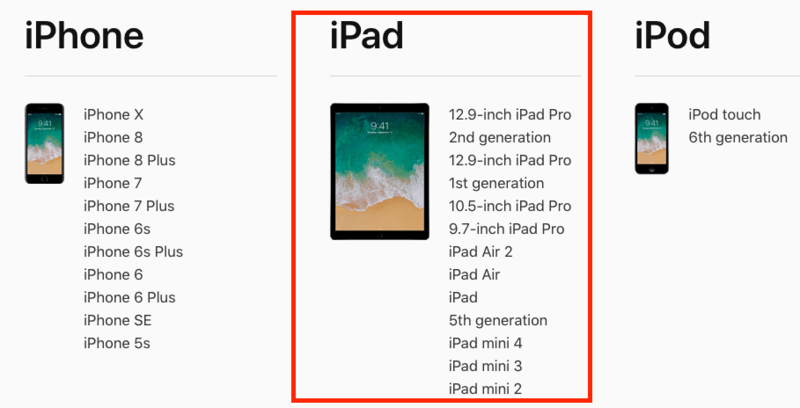 If your iPad is eligible for the iOS 11 (or soon iOS 12) update, congratulations! You should have received a pop-up notification. Feel free to test out the newest features. Kindly share with us what you think about them. Andreas is an Apple and Microsoft fanboy who works with his Mac and lives with a PC at home. While he is not reading technology journals, you’ll probably find him playing online games with friends or hiking in the wild.